*sweet Cutter passed away Jan.17/2014"
These two are so gentle and sweet furbabies. How miraculous that they still have the true ST nature, as these babies have been terribly abused, someone even witnessed the beating of these babies. And after all of that, they just cuddle into your arms with complete trust. Molly has a paw missing, and I do not want my mind to think of the reason. They have other scars from their cruelty, both have what I call cauliflower ears, from the ears being pinched. Molly had an injury to her eye, which cannot be reversed, and has limited sight in that eye. 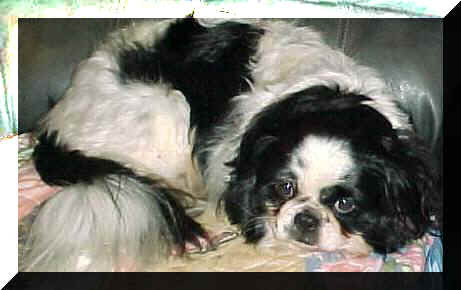 Chewy has loss of pigmentation and also a scar in his eye, but feel that this can be reversed with meds. And still all they ask for is love, not a mean lil bone in their whole being. 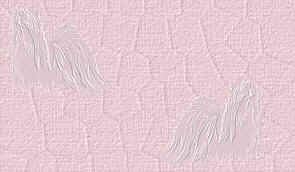 True gentle souls. These babies are very bonded, and will only be adopted together. Maybe that is how they survived, they had each other. These special furbabies did a full circle, the lady who originally helped to get them to safety, could not forget their faces, and realized they belonged in her home and heart. Now residing happily together in Sequim, WA. 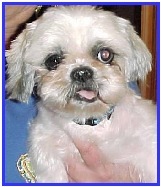 This boy is a registered Shih Tzu, but has the look of a Pekinese. 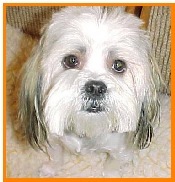 In the history of the Shih Tzus, they did breed them back to the Pekes to make them smaller, and this boy is either a throw back, or a cross. Regardless of his breeding he is absolutely adorable. He has the most luxurious coat, soft and beautiful. He has eyes that will melt your heart and a personality to go with them. He is wonderful in all aspects, except he does not like SMALL CHILDREN. He feels uncomfortable with them. An Adult home ONLY. Snickers and I were so lucky, he found the perfect home, with a new little sister Shih Tzu, Suzy, his new home told me that he "is never coming back" they adore him, and I adore his new family, again I am blessed to find such a loving home, for this loving boy...happily residing in Agassiz, B.C. Canada.